We got there just as Hot Milk came on stage; 'dual-fronted emo powerpop' indeed, and it was so much fun to bounce around with them and their tunes. Take Your Jacket is an absolute bop and their whole set was incredible - it's amazing to see new and upcoming bands smashing big shows like this and they really really did. If you get the chance to catch them at a show any time soon, definitely go for it because you'll have a ball. The LaFontaines were up next, and I'd given them a bit of a listen beforehand so I kind of knew what to expect. They're not really my cup of tea, all in all, but I can appreciate good drum beats and sick vocals, and as a band they fit together perfectly so it was entertaining to watch - if you are into them as a band, you'll definitely love seeing them live. And then of course, it was time for Deaf Havana - and what a show it was. They opened with Fever from All These Countless Nights then went straight into Mildred, a guaranteed crowd pleaser from 2013 album Old Souls. This was followed by Worship off the new album, Rituals, and by this point the room was getting bouncy. After a brief chat about being tired from over 5 weeks of touring, and James quoting a bit of Lewis Capaldi, they tunes were back: I'm a Bore (Fools and Worthless Liars) Trigger (All These Countless Nights) and Leeches, also from Fools and Worthless Liars. As a long-time fan, it was amazing to see older songs thrown into the set and people loving it. After playing Fear from Rituals, the acoustic guitar came out for Happiness (All These Countless Nights) followed by one of my personal highlights, Hunstanton Pier from Fools and Worthless Liars which is one of my favourite songs of theirs - and it didn't disappoint. Following on from this things turned up a notch with two tracks from Rituals: Hell and Rituals, which had everyone dancing and jumping and generally having a Really Good Time. Next up: Cassiopeia, a bonus track from All These Countless Nights that sounds absolutely sick live. Following on from this, after some more jokes and interaction, was Pensacola (All These Countless Nights) which was my absolute favourite song of the set. It's been one of my favourite songs of theirs for SO long and it was amazing to finally hear it live, sounding so good. Then straight into Cr33pin, a single which came out last year pre-Rituals - a proper bop if there ever was one, and seeing James dance to it as the crowd sang it back to him was pretty special. Holy from Rituals came next, cue more dancing; Boston Square (Old Souls) and Sing (All These Countless Nights) after that. Then that was that, except it wasn't, because they came back on and launched into Sinner (Rituals) to end the show on a complete and utter high. 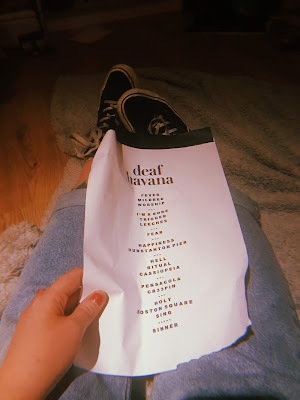 What a night it was - it definitely lived up to my expectations and the set list was a dream, for me; like I said, seeing a real mix of older and newer songs was brilliant. The love the boys have for each other and for the fans is plain to see, and makes for a gig that's just full of light and laughter. See ya next time DH.